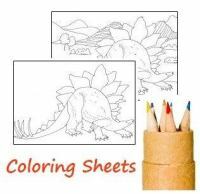 Are your kids interested in the stegosaurus dinosaur? Find out more about this amazing dino. Here is the place to find facts and information about its size, habitat, diet and more! Stegosaurs lived about 150 million years ago in the Late Jurassic/Early Cretaceous Period. The first fossil was discovered by Professor Othniel Marsh in 1877. The large, bony plates he found on its back reminded him of roof tiles - so the name he gave it means 'roofed lizard'. You pronounce their name 'steg-uh-sawr-us'. 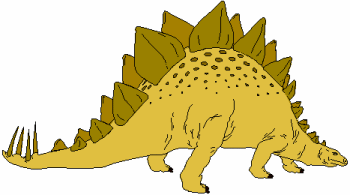 The meaning of Stegosaurus is 'roofed lizard'. Stegosaurus had brains the size of ping pong balls. They were 4 meters (14 feet) tall. They weighed 2 tons (about an average American car). Some of the bony plates of this dinosaur can be very large - over 1 meter (3 feet) high. Scientist are not sure how how the plates lay - or what they were for. Some believe they were for defence, but others that they may have acted as a way of controlling temperature. Diet - What did the Stegosaurus eat? Habitat - where did they live? How big was it compared to a man?